Today we’re going to talk about what being an esthetician over the past few years has meant to me, and how it’s impacted my life! Soooo, lets get started! I am currently on my 5th year of being a licensed esthetician! (yay!) I have had many jobs over the years, and I cannot tell you how happy I am to finally feel settled in my business and at home. It is exhausting bouncing around trying to find the right fit for yourself. The industry in my opinion can be really challenging as a newbie, and a lot of people tend to get licensed, realize its not as easy as they thought and then switch careers yet again or go back to what they were doing before. I have to admit that even I have had many fleeting thoughts myself as I was coming into this world. Although, with my unfinished college education I wouldn’t have any fall back really, and so I told myself I was going to try and try to make it work. So far, with much prompting and immense effort, it has worked out! During the last few years I have had many side jobs to help supplement my income as an esty. Anywhere from burning fat off of peoples belly’s to selling dog clothing I have had quite a bit of variety! With all of the crazy jobs I have taken as an esty and not as one I have met a lot of people over the years even in just my short few. I have made great friends with people not only in the industry, but also my clients! Additionally, one of my said clients was actually the woman who got my husband the job he has now. 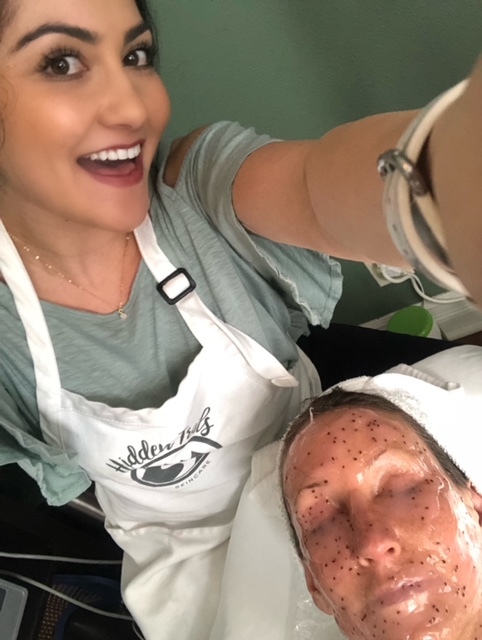 In fact, if I had never met her during her radio frequency facial lifting treatment at that med spa I would probably not even be here in Oregon, and Hidden Trails Skincare would not even exist! Crazy. I like to think that everything happens for a reason, but I also like to think that we have control over our own destinys. Conflicting argument? I know. Being an esthetician has really become a huge part of who I am. It is constantly something I am thinking about and trying to improve upon. My philosophy is that your work if at all possible should be something you enjoy. Now this is not always the case, and I know it’s not as easy as it sounds. I luckily enjoy everything that I do minus the accounting part that I am 3 months behind on and counting… I as an esthetician am carrying loads of laundry through dowtown from the spa to my car to my house EVERY DAY. I am also answering calls/texts from clients 24/7, and constantly buying products and gadgets to make us better. Why do I do it? I do it, because nothing is more important to me than being able to pursue what I love, and help people along the way. I have said before that the connections that I make with my clients is the very reason why I do what I do. I love being able to provide a service that people look forward to coming in for, and I like being able to improve people’s confidence through helping and educating them on how to maintain the health of their skin. The added bonus? They get to relax and unwind during their treatments. So much of what people in our society rarely get to do. So give me a giant bag of laundry, 10 million texts and a thousand back bar to replenish, so long as I get to do what I love to do and as long as my clients will have me. My life could have taken numerous different paths, but I am so grateful that it took me down the one of being an esthetician. And a special thank you to my client (you know who you are) who let me use this photo of us with her hydrojelly mask on!